Sage CRM helps over 15,000 small and medium-sized companies world-wide, to drive business productivity, accelerate sales and interact with customers in new and innovative ways. Now, companies can further grow their business by leveraging the power of social media and taking advantage of the latest mobile developments. According to Barton Goldenberg, founder and president of ISM, "the winners of this award are key influencers in the CRM community". The Top 15 winners are available for purchase on ISM's website. With the introduction Sage CRM 7.3 and its ready to use Dashboards, Workflow, Alerts and Escalation, companies can streamline and optimize every aspect of client interacts, from sales to service. 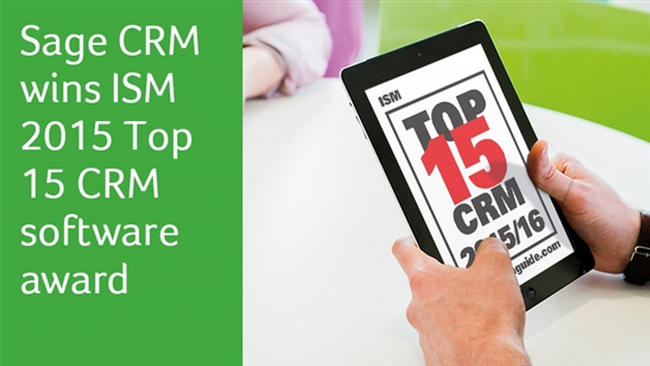 *The ISM Top 15 CRM Awards are now presented bi-yearly. The next award selections announcement will be in 2017.